​Tatman Mountain and Squaw Peaks are erosional remnants of Laramide Tertiary basin fill sediments in south central Bighorn Basin. Tatman Mountain is capped with Tertiary gravels that mark a former streambed of the Greybull River. The gravels helped preserve the large terrace from erosion (see https://www.geowyo.com/polecat-bench--petm.html). The Squaw Peaks have Eocene volcanic rocks lying on their top. Tatman Mountain rises about 1,300 feet above the valleys and forms a drainage divide between the Greybull River (north) and Fifteen Mile Creek (south). The Squaw Peaks are 800 to 1,200 feet above the the valley floors and separate Fifteen Mile Creek (north) from Gooseberry Creek (south). West aerial view of Tatman Mountain and Squaw Peaks region, south central Bighorn Basin. Fenton Pass Road shown by red line. Cross section AA’ location shown by black dashed line. 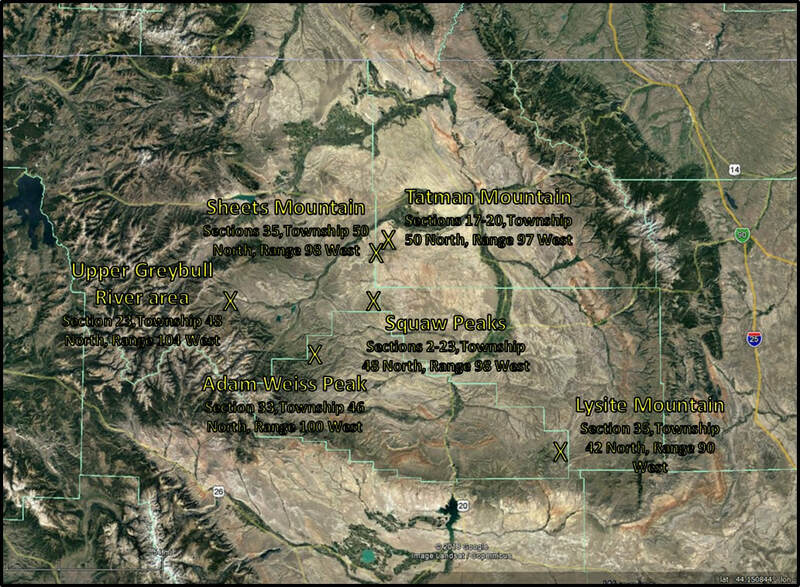 Image: Google Earth; Data: Rohrer, W.L and Smith, J.W., 1969, Tatman Formation: Wyoming Geological Association, 21st Annual Field Conference Guidebook, Fig. 3, p. 50. ​Fenton Pass Road is an unimproved dirt trail that extends 15 miles from Big Horn County Lane 40½ on the north (1 mile south of Fenton, Wyoming) to 15 Mile Creek Road on the south. It crosses Tatman Mountain through Fenton Pass at 5,998-feet. The road’s elevation profile is a good representation of Tatman Mountain topography. West aerial view of Tatman Mountain-Squaw Peaks area. Two largest exposures of the Tatman Formation shown in light golden tan, Willwood Formation in light brown, Fort Union Formation in dark brown and Quaternary in yellow. Fenton Pass Road shown by red line. Cross section AA’ location shown by black dashed line. Abbreviations: SP, Squaw Peaks; TM, Tatman Mountain. Image: Love, J.D., and Christiansen, A.C., 1985, Geologic map of Wyoming: U.S. Geological Survey, scale 1:500,000. ​Tatman Mountain is the type location for the EoceneTatman Formation. The formation is present only as isolated erosional remnants. Varying from about 650 feet thick on the west edge of Tatman Mountainto 730 feet on the Sheet Mountain spur and almost 850 to 950 feet at Squaw Peaks. Scattered partial outcrops are also found to the southeast at Lysite Mountain, Bridger Mountains (230 feet), to the southwest at Adam Weiss Peak, Grass Greek area (50-150 feet) and the upper Greybull River area, south of Carter Mountain (no thickness reported). The formation consists of poorly lithified, fine-grained sandstone with pelecypod and gastropod casts, and carbonaceous shales with some calcareous concretions deposited in ancient lakes and swamps in south central Bighorn Basin. Numerous Quaternary landslides of the formation are located surrounding the plateau. The Willwood Formation lies below the Tatman Formation and the Fenton Pass Conglomerate unconformably overlies it at the type location. The general area landscape exhibits plateaus with surrounding badland topography. 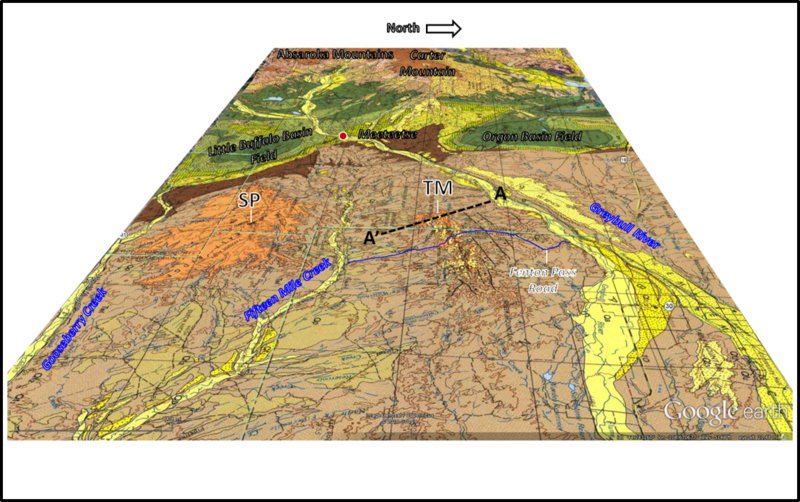 Arrows on the geologic map point to the two major sites of Tatman Formation deposition in a light golden tan color at Squaw Peaks (SP, left) and Tatman Mountain (TM, right). The older Willwood Formation is shown by the light tan color that encircles the Tatman Formation outcrops. The Willwood is also overlain by rocks of the Absaroka Supergroup to the west in the Absaroka Mountains area. Scattered erosional remnants of the Tatman Formation., Bighorn Basin. Image: Google Earth; Data: Rohrer, W.L. and Smith, J.W., 1969, Tatman Formation: Wyoming Geological Association 21st Annual Field Conference Guidebook, Fig. 3, p. 50. Tatman Mountain measured section. The Tatman Formation is 990 feet on the measured section. Image: After Rohrer, W.L, 1964, Geology of the Tatman Mountain Quadrangle, Wyoming: U.S. Geological Survey GQ-311, Scale 1:24,000: https://ngmdb.usgs.gov/Prodesc/proddesc_772.htm. Squaw Peaks measured section. The Tatman Formation is 867 feet on the measured section. Image: After Van Houten, F.B., 1944, Stratigraphy of the Willwood and Tatman Formations in Northwestern Wyoming: Geological Society of America Bulletin, Vol. 55, No. 2, Fig. 4, p. 207. There is no structural component to the mountain. It is merely an erosional remnant of nearly flat lying Tertiary strata. 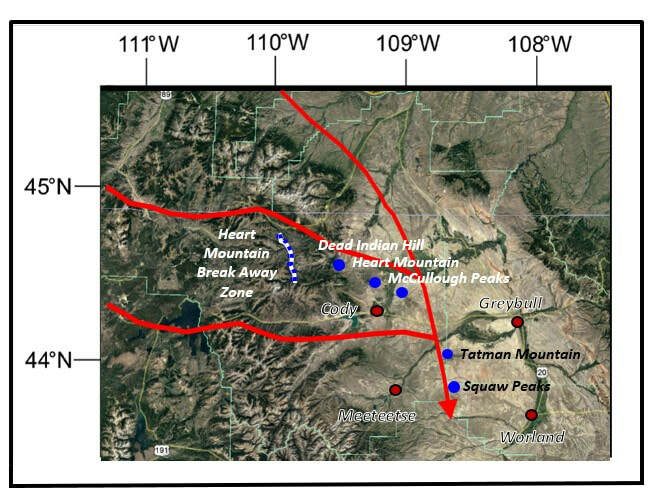 Tertiary bed dips indicate that the Bighorn basin structural axis is located beneath Squaw Buttes area. At Tatman Mountain the formation dips 2 degrees southwest at Squaw Peaks dip is 2 degrees east. The dip is 4 to 5 degrees northeast along the southwest margin and 1 to 2 degrees north to the south. An elevation profile of Fenton Pass Road shows the topography of Tatman Mountain. The location of the Eocene lake was probably centered near Squaw Peaks with the northern margin at Tatman Mountain. 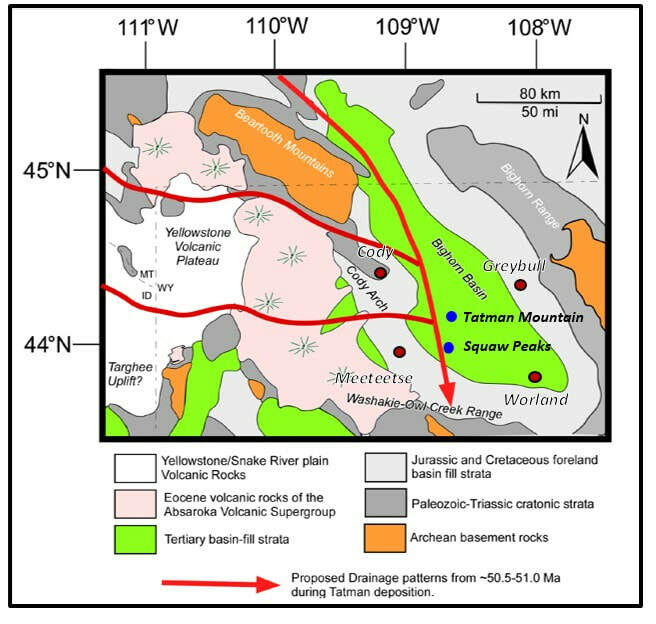 Formation dips indicate this as the depositional center of the Tatman basin. The Eocene was a period of numerous lakes due to the uplift of the Rocky Mountains and formation of intermontane basins in Wyoming. The highlands supplied the basins with water and sediment from multiple directions. Tatman cross section displaying the Tertiary strata. Location of cross section shown on geologic map above. Vertical exaggeration x 4. Abreviations: Qfs Quaternary Fenton Pass Sandstone, Qfc Quaternary Fenton Pass Conglomerate, Qls Quaternary landslides, Qtg Quaternary terrace gravels, Tt Tertiary Tatman Formation, Tw Tertiary Willwood Formation. Image: Rohrer, W.L, 1964, Geology of the Tatman Mountain Quadrangle, Wyoming: U.S. Geological Survey GQ-311, Scale 1:24,000: https://ngmdb.usgs.gov/Prodesc/proddesc_772.htm. Fenton Pass Road Elevation Profile: 15 mi from County Lane 40 ½ (north) to 15 Mile Creek Road (south). The route elevation profile is a good representation of Tatman Mountain topography. Elevation lines are 250 feet each with 6,000 feet at the top. The vertical lines are one mile spacing. The most complete section of Tatman Formation is found at Squaw Peaks. The formation is the main geologic unit exposed in the area. Outliers of Eocene volcanic rock cap the peaks. These rocks are 50 to 95 feet on the northwest flank and thin to about 30 feet to the southeast. They are composed of tuff, lava, and volcanoclastic units. The volcanic rocks lie nearly vertical on the Tatman Formation. North view of the Squaw Peaks. ​Image: After musicman82, 2009: Summit Post; https://www.summitpost.org/the-squaw-teats/569589/c-569605. Geologist David Malone and others have made a convincing argument the allochthonous volcanic rocks represent a distal outlier of the Heart Mountain Detachment. Allochthonous is a term applied to rocks which have not been formed or deposited in place, but moved in. Their conclusion was based on lithology, zircon age dating, timing and stratigraphic relationships. This would extend the limits of the Heart Mountain slide another 65 miles south eastward and the distribution area from 1,400 to 1,930 square miles. The blocks may have been transported and emplaced by a south flowing Eocene paleodrainage. Allochthonous volcanic rocks on top of the west butte at Squaw Peaks. The rocks are sourced from either the Cathedral Cliffs or Lamar River Formations, Absaroka Supergroup of northwestern Wyoming. Vol. 51, No. 4, Fig. 4, p. 333; https://www.researchgate.net/publication/272488514_Origin_of_Allochthonous_Volcanic_Rocks_at_Squaw_Peaks_Wyoming_A_Distal_Remnant_of_the_Heart_Mountain_Slide. Eocene paleodrainage (50.5-51.0 million years ago), southwestern Bighorn Basin. McCullough Peaks were formerly the most distant Heart Mountain outcrop block at 55 miles from the detachment (white and blue dotted line). 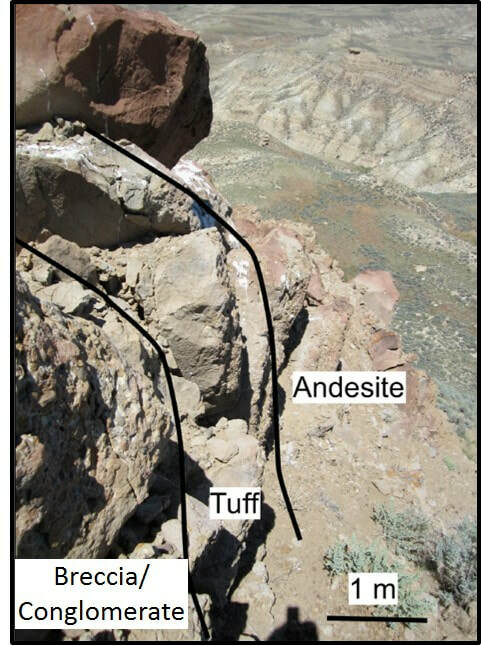 Image: Top:Malone, D.H., Craddock, J.P., and Mathesin, M.G., 2014, Origin of Allochthonous Volcanic Rocks at Squaw Peaks, Wyoming: A Distal Remnant of the Heart Mountain Slide? : The Mountain Geologist Vol. 51, No. 4, Fig. 8, p. 338; https://www.researchgate.net/publication/272488514_Origin_of_Allochthonous_Volcanic_Rocks_at_Squaw_Peaks_Wyoming_A_Distal_Remnant_of_the_Heart_Mountain_Slide; Bottom: Google Earth. The story of the Heart Mountain detachment, which occurred about 48.9 million years ago, is one that continues to evolve. The triggering mechanism, the catastrophic speed of emplacement and the immense scale of the slide is a geologic wonder that geologists have studied over 100 years. The volcanic rocks on top of Squaw Buttes tell another piece of that story.